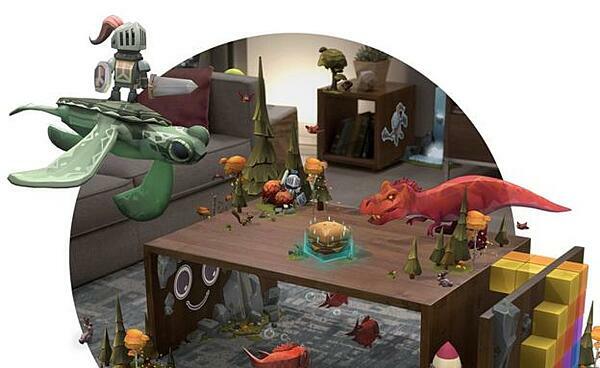 Magic Leap is a startup based in Plantation, Florida working on a futuristic augmented reality headset. It quickly rose to fame after it was reported that it had raised ~$500 million at a ~$2.3 billion valuation from Google, Alibaba, Warner Brothers, Legendary, Fidelity and a host of other top tier investors. While the augmented reality startup has been notoriously secretive, the demos it has put out have shown just how impressive the technology could be once properly commercialized. Now that you have a little background, here were our impressions of Magic Leap. When our Magic Leap One arrived, there was actually someone there to hand deliver the device, help with the unboxing and demonstrate how to calibrate it. While the Magic Leap One wasn’t too difficult to get set up, it would have probably been tricky for a non-tech savvy user to get going quickly with it. Once the device got calibrated, the next step was to map our local environment. To do this, we put the Magic Leap One on and had to try to find virtual targets that the Magic Leap One projected into our local space. The purpose of this step is so the Magic Leap One knows where and how to project 3D content to make things look as realistic as possible. 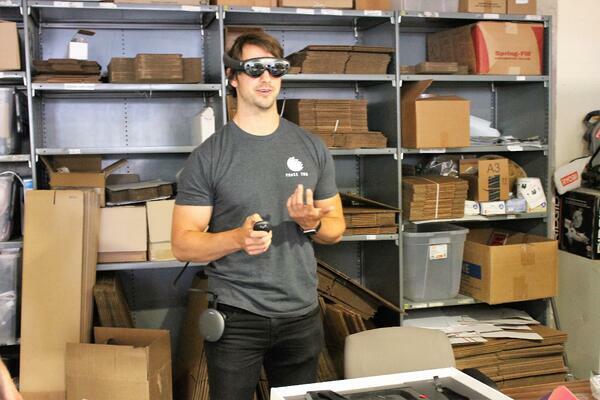 *One aspect of the Magic Leap One that made it difficult to review was there was no screenshot functionality. The screenshots below were taken from other reviews. In this demo, you could drop 3D characters in your local environments and watch them battle/interact. For example, we dropped 2 virtual knights on top of our conference table and watched them fight. We then dropped a T-Rex into the world and watched it attack the 2 knights. There were about 2 dozen characters/items you could drop into your local world. These included: cheeseburgers, schools of fish, and a flying saucer (and yes the flying saucer does abduct things…). All in all, a very entertaining demo! 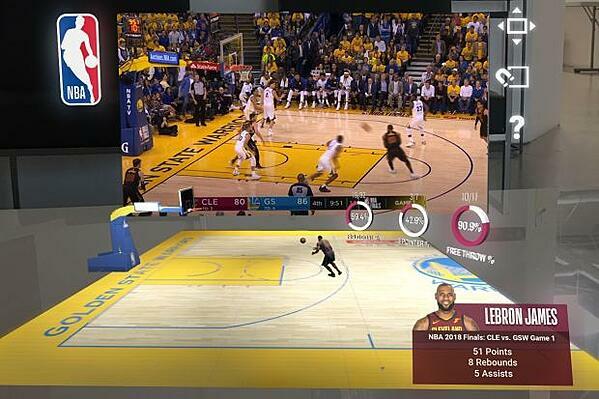 For the NBA highlight demo, you got to place a virtual big screen TV into your local environment. You were then able to watch LeBron James highlights and then see a 3D breakdown of the play that led to score. What made this app really cool is it showed the potential for AR to replace the big screen in your living room. While all of the demos we did on the Magic Leap were compelling, by far the most disappointing part was the lack of content. There was maybe 1 hour worth of content to look at or play with. This made it pretty underwhelming considering it’s a $2,300 device. For augmented reality to take off, it is clear that there will need to be a critical mass of 3D content created to get people interested in forking over the money for one of these AR headsets. As we mentioned in a prior blog post, 3D scanning will likely be a major catalyst for augmented reality to gain adoption since it is one of the easiest ways to generate 3D content (just how 2D cameras are the quickest way to generate 2D content). Want to see how one of our customers is already using the Twinstant Mobile full body 3D scanner to make 3D content for an AR app?